Jake Trueman has revealed he almost opted for a career in football before being lured back to rugby league. The 19-year-old Castleford Tigers half-back has been tipped for big things after picking up the Super League Young Player of the Year award in 2018. But if it were not for some family advice, his talents could have been lost to the game. 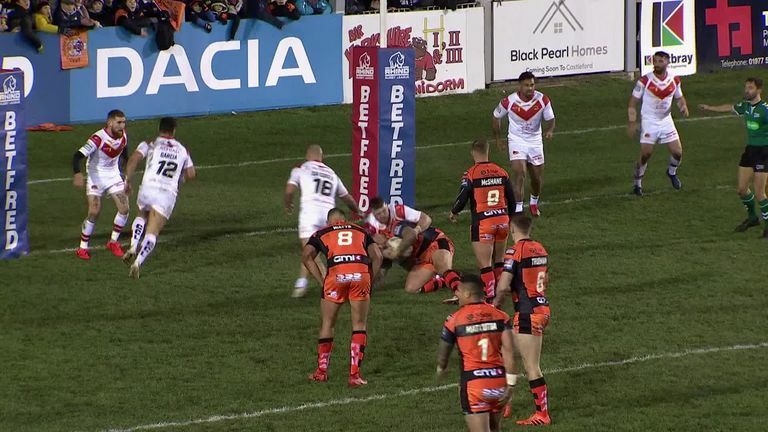 "I started playing rugby league when I was about four or five," he told Sky Sports. "My brother played for West Bowling so I wanted to play for them but then I left to play football for a few years and played for Bradford City. "Then, I'm not sure why, I thought I'd try rugby again. I think my brother and my dad were a big influence on that and looking back it was probably the right decision." His talent was nurtured by Bradford Bulls where he made his senior debut in 2016 before making the switch to the Tigers at the start of 2017. He offered an insight into what was to come with a hat-trick against Wigan Warriors in September that year in only his second Super League appearance. That came while deputising for Tigers star Luke Gale, whose current injury puts the spotlight back on Trueman. "If you lose a player like Luke then someone has got to step up and take on his role because he is such an influence on the game when he is playing," said Trueman. "He's a leader out there so it probably does add some pressure but I think it will bring the best out of me." Trueman was handed the Tigers' No 6 jersey for their season-opening 20-4 victory over Catalans Dragons but is taking nothing for granted as they prepare for their latest clash with Hull FC on Thursday night. "It's nice to get that number but it really doesn't mean anything if I'm not training properly and playing well because we've got other halves in the squad who can take my spot," he said, "but it is nice that the coaching staff have confidence in you." Trueman finished last year with eight tries from 28 appearances and was rewarded with a new four-year deal at the end of the season. He was delighted to extend his stay at The Jungle and continue to work with the Tigers' coaching team and in particular tap into the knowledge of former half-backs Danny Orr and Ryan Sheridan. "They have been massive for me over the last three years," insisted Trueman. "They have brought me on so much and I couldn't ask for a better coaching staff to improve me."